During contour segmentation (activated with the keyword CONTPRON), the field for the contour table has been detected as too small. For every permissible contour element (circle or straight line) there must be a row in the contour table. Base the definition of the field variables of the contour table on the contour elements to be expected. The contour segmentation function divides up some NC blocks into as many as 3 machining cuts. 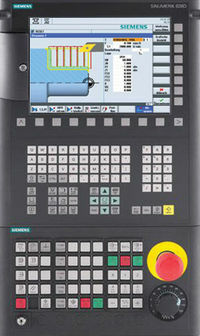 Example: N100 DEF TABNAME_1 [30, 11] Field variables for the contour table provide for 30 machining cuts. The number of columns (11) is a fixed quantity.